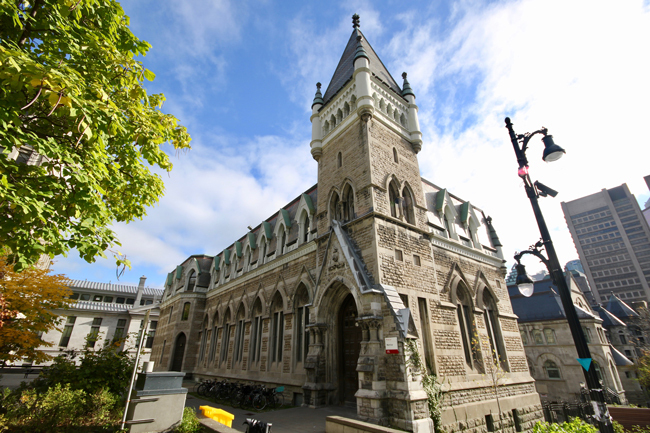 Originally the home of the Presbyterian College of Montreal, this Gothic style building was donated to the University in 1961, and renamed after David Morrice, who financed part of its original construction. Originally the home of the Presbyterian College of Montreal, this Gothic style building was donated to the University in 1961, and renamed after David Morrice, who financed part of its original construction. It features a large tower with a spectacular view of downtown, and a beautiful study space furnished with antique wooden display cabinets and lit by stained glass windows.